After five studio albums, the last one being The Congregation (2015, see review), the Norwegian progressive metal band Leprous thought it was about time to release a live album and DVD. Live At Rockefeller Music Hall was shot and recorded on a hometown show in Oslo on 4 June 2016. The set list not only contains songs from their last album The Congregation but also a couple of tracks from their back catalogue; furthermore you can enjoy various guest appearances from, for example Ihsahn, Ornes Andersen (their previous drummer) and Hakon Aase on the violin. You can enjoy 14 tracks on the CD and DVD. The DVD has also a lot of bonus material, consisting of behind the scenes stuff, some video clips and material of Leprous at the same venue 13 years earlier. Highlights are songs like: Slave, Moon, The Valley, Forced Entry and Contaminate Me. The sound is really great, the band is spot on and the audience is also really into the music from the beginning sounds of The Flood till the last tones of Contaminate Me. 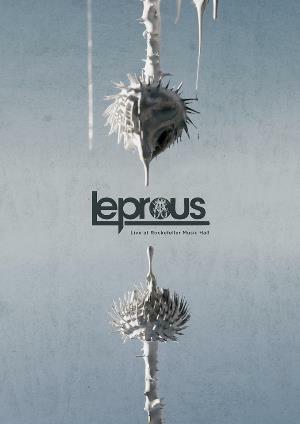 So, you could say that this first live double CD and DVD of Leprous are musically amazing and visually infuriating, as it is a very intense performance of almost two hours; showing and proving that Leprous is one of the most exciting prog metal bands in the metal scene. Buy it, watch it and enjoy it! !